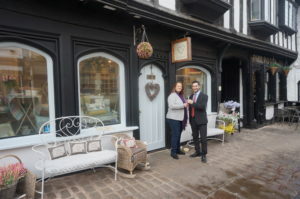 Cooper Green Pooks (Commercial Property Consultants) are pleased to report the letting of 14 Butcher Row, Shrewsbury to a local couple that will continue to trade as White Orchard. The mediaeval town of Shrewsbury has alleys, lanes, and rows where hidden gems and interesting places and spaces may be found to exercise a little retail therapy. The pedestrianized area of Butcher Row is no exception, offering an idyllic repose away from the immediate hustle and bustle of Pride Hill. The retail space occupied by White Orchard is in a beautiful timber-framed building, characteristic to and typical of the town. Ready for spring, reopened for trading with fresh décor and under new management White Orchard are determined to keep to their roots, offering a range of attractive and thoughtful Home & Garden Gifts and décor and beautiful women’s accessories, including Italian Leather handbags, scarves, affordable costume and sterling silver jewellery all delightfully presented in a charming New England style palette of cool neutrals and warm pastels creating a welcoming environment to browse and to shop.